I was recently reintroduced to this book as one of my children received it as a giveaway at an event at our local library. 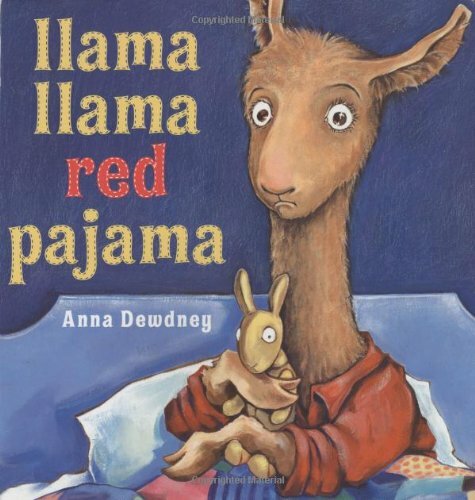 Llama Llama Red Pajama, written and illustrated by Anna Dewdney, tells the story of baby llama who just got put to bed by his mama. What happens after Baby Llama gets put to bed is what happens almost every night in my house; Baby Llama wants a drink, while Mama does dishes at the sink. Baby Llama calls his Mama, she says she'll be up soon, but gets busy with other Mama things. Pretty soon Baby Llama grows impatient and cries out for his Mama. Mama finally comes running, probably because she's afraid Baby Llama will wake his little sister, and firmly tells Baby to quit his llama drama and go to bed. I'm not even kidding, the author must have written this book after watching a night in the Fields house. And what is better than a book you can relate to and make connections with? Well, not much in my personal opinion. It's also hard not to fall in love with the singsong poetry-like rhyme of the book. The perfect bedtime story for children ages 2-6.